Bernhard Lehner is a hydrographer whose work is about to go global. Fusing the fields of hydrology and cartography, he has created a one-of-a-kind map of the world’s rivers that is included as a pull-out in the April 2010 “Fresh Water” Issue of National Geographic, the iconic magazine that’s read in 32 languages by more than 8 million people every month. Six years ago, while working on a watershed conservation project with the World Wildlife Fund (WWF), Lehner and his colleagues hit a snag. They were looking to characterize freshwater habitats within a remote region of the Amazon Basin covering parts of Peru, Bolivia and Brazil. The river maps of the three countries that existed weren’t good enough because, when pieced together, they didn’t exactly match up at the borders. Lehner’s solution proved to be the catalyst for a wildly ambitious project: to be the first to build a comprehensive, seamless, digital map of the world’s rivers, in unprecedented resolution and detail. The project that WWF dubbed “HydroSHEDS” (Hydrological data and maps based on SHuttle Elevation Derivatives at multiple Scales) kept growing from there, computing power was ramped-up and Lehner and his team began writing code used to eventually run through all the continents. 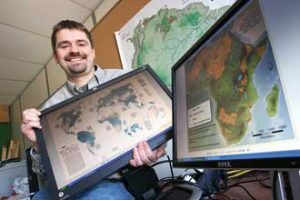 Lehner left WWF for a professorship in Global Hydrology in the Geography Department at McGill four years ago and has been working steadily on the map, with continued support from WWF, ever since. While the global river map is being formally released in a paper format in National Geographic, HydroSHEDS remains a work-in-progress as Lehner and his team continually add more attributes like river names and classes, the outlines of sub-basins and catchment areas and links to other layers such as lakes and reservoirs. But the map already appears to have limitless practical applications. When asked, Lehner admits he doesn’t know where to begin. From conservation biology and ecology to climate modelling to irrigation and food production, the map is in high demand. The map data are free and available for download, and Lehner estimates that since the data sets were made available online, there have been about a thousand downloads a month. goes mainstream. “Personally, I really like that this scientific product will get such broad attention,” said Lehner.